Amazing Space with Dulux. cowbiscuits | UK Lifestyle, Style and Beauty Blog. : Amazing Space with Dulux. Today I am sharing with you my experience with Dulux's awesome new personalized home styling service - Amazing Space. Once I was happy with my summary it was sent off to find the perfect designer for my project who was going to do all the hard work for me! I booked in a half hour slot for my designer to video call me and show me what they had been working on and had come up with. I didn't really know what to expect but I was honestly blown away with how much effort and time my designer Bethany put into my project! She was so sweet and lovely and incredibly passionate and excited about my project which in turn made me excited to get started too! 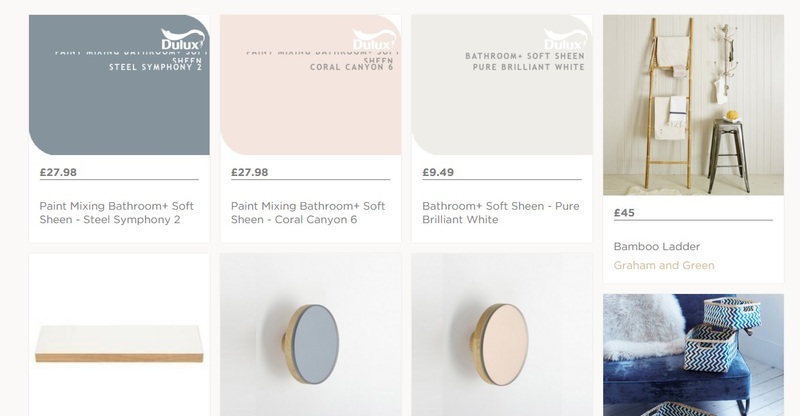 Bethany had chosen wall colours and accessories to compliment some of the furniture I already own in my bathroom aswell as some new pieces which are suggestions if I wanted to revamp a bit more. We talked through every single part she had picked out and how I felt about it, if I liked it or if I wanted it taken out. I LOVED Bethany's choice of colour for my bathroom it was beautiful and so complimentary of how I wanted my bathroom to feel in general. After usually 24 hours your designer will give you the finished summary and a full shopping list of how much and where you can click and purchase any of the items shown. Bethany actually send me mine a couple hours after our great conversation I'm guessing because she was super passionate about it which was incredible. I was sent a floor plan, full paragraphed details of what the room can transform into my shopping list (very bad for my bank!) and an amazing recreation of my own bathroom how it will look if I follow the plan - it was so good I actually thought it was my bathroom until I noticed the window was a little different and had fake sky haha! I highly recommend this service it is so helpful especially for the busy/lazy people like me who would never get a plan together ever! The service was offered to me free of charge but is usually £75 and although to me that is quite expensive (I'd be more inclined if it was about £50) I do honestly think this is a service worth paying the money for as the experience with my designer left me buzzing and wanting to whip the paint out and get decorating. Also the hard work and attention to every detail that has gone into their work is wonderful and something I would never think of. What do you think of my bathroom plan?